The first hesitant tendrils of fall are filtering through the air. 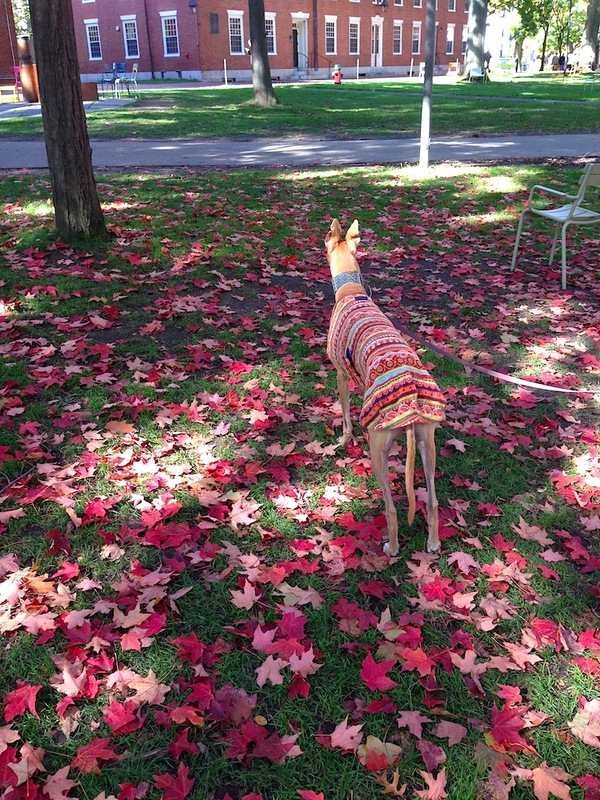 Frugal Hound is sniffing the cool breeze expectantly and thus far, one leaf hath crunched underfoot–it was either premature in its falling or just a dead leaf, but I’ll take it! Autumn is, without contest, the most favored of seasons for the Frugalwoods. It’s a time rife with frugal opportunity and its natural beauty is unparalleled. Fall, though an unassuming calendar event at first blush–nestled as it is between the glare of summer and the contrition of winter–deserves adulation for the noble atmospheric shift it brings about. My adoration for the trappings of fall–pumpkins, orange things, Halloween, nutmeg–is without bounds. Anything even remotely resembling autumn is sure to be met with high praise from me. Would you fancy a list of all the reasons why? Oh good, because I made one for you! 1) I consider autumn a harbinger of the past. We’re reminded of the harvest, the indisputable progression of the natural world, and our utter lack of control over the passage of time. Our modern lives do much to negate each season. We’re shuttled from climate controlled home to air-conditioned car to excessively HVAC’ed office building. It’s entirely possible we’ll spend only a scant few minutes outside, scurrying as we do from parking lot to cubicle. But nature remains oblivious of our attempts to subsist in its absence. The temperature will drop, vegetables will ripen, and our bodies will acclimate to this variance in our surroundings. 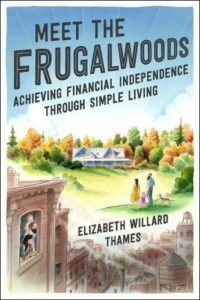 At present, Mr. Frugalwoods and I live lives almost entirely divorced from the environment’s rhythm. Our work isn’t seasonal and, other than wearing sweaters, our daily existence is ignorant of the external alternations in our environment. Something we dearly look forward to with homesteading is the incredible variation in our routines that each season will portend. Despite our current urban lives, we try to react to the seasons as best we can within our limited city parameters. Chiefly, autumn is a time devoid of climate control. There’s no need for heat or air conditioning during these clement months of September and October. I’ve waxed poetic on the many benefits of going without artificial heating and cooling, and I do find we’re happiest with the doors and windows open and the machines decidedly shut off. 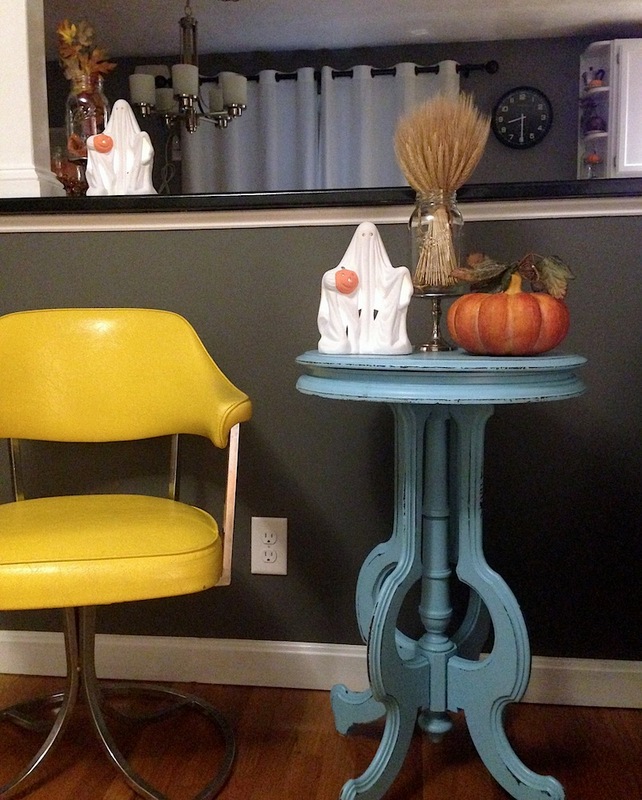 All of my tacky–yet fabulous–fall decor trots out to deck our frugal halls. I have a penchant for decorating in accordance with each season and adorning the house with my hand-me-down pumpkins is something I look forward to every year. 4) Every vegetable imaginable is in season. Produce is cheap and delicious as it crunches under our fall-loving teeth. We zestfully munch flavor-filled tomatoes, squash, and the panoply of harvest-y wholesomeness that springs forth. 5) Some fruit is also in season! I’m looking at you, apples. 6) Candy corn is in season. Oh yes, you read that right: candy corn, the most perfect of junk candies. It’s truly divine in every high-fructose corn syrup-addled way imaginable. It’s triangular (unique! ), doesn’t taste remotely like corn (rebel! ), is only available this time of year (rarity enhances satisfaction! ), and arrives in assorted “flavors” (caramel, s’mores, candy apple, and autumn mix–never understood that last one, but I crave it all the same). It’s been suggested to me that perhaps my adoration for this little treat is a bit too intense. After all, it is kinda gross. But I will persist. I haven’t been eating much sugar during my pregnancy, so I’ll have to ration my consumption lest I knock self into a coma. But a few tidbits of candy corn can’t hurt (right?!?). Hark! 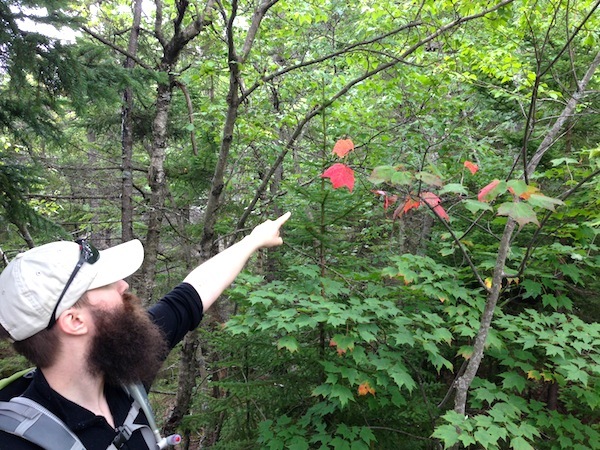 The first turned leaf on a hike. From hiking to strolling to leaf peeping, fall offers a veritable cornucopia of en plein air delights. Watching leaves change while we climb a mountain is, without contest, our most blissful autumnal pursuit. Crisp air at the summit and brightly-hued leaves on the trail conspire to make fall the ideal season for hiking in the northeast. But even a walk around the neighborhood explodes with wonder during this season. No one is too hot or too cold, there are ample squirrels for Frugal Hound to spy on, and the park across the street from our house will finally re-open after a year of renovations (how, you might ask, can one spend an entire year renovating a tiny city park? Some questions have no answers). Autumn is the time of festivals. From beer fests to harvest fests to pumpkin fests to Rib Fest (a Cambridge festival featuring… ribs!) to Honk Fest (a rollicking event highlighting adult marching bands)… everywhere we turn, there’s a free event parading through our city streets. 9) You can pose for photos with vegetation. Never is it more appropriate to plop oneself, or one’s offspring (furry or human), down next to a squash and snap a pic. I’ll be honest, I love pumpkins. They’re gorgeous, they’re orange, they’re preternaturally glossy, and, I’m going to look like one this October! Since I’ll be supremely pregnant next month, I fully intend to avail myself of the trite, yet classic, pose of pregnant-lady-with-pumpkin. Just you wait. 10) Frugal Hound receives her bi-annual bath. While this is probably one of the darkest days on her annual hound-calendar, her autumnal bath is pretty hilarious for us. Poor Frugal Hound does not appreciate the water or the scrubbing and she resembles the most tragic of damp animals when Mr. FW hoists her into our tub. But we should all bathe at least twice a year, right? 11) The return of more varied cooking methods. Mr. FW, being a consummate seasonal chef, relishes hauling out his crock pot, stock pot, wok pot (not really a pot), bread pot (ok that’s definitely not a pot), in order to cook in accordance with the ambient temperature in our home. Our diet alters from summer to winter and he shies away from heartier, hotter meals all spring and summer. Hence, fall portends homemade breads, stews, soups, and other belly-warming dishes. All summer long, he barely touched the oven and very few stovetop burners were ever alight. As we progress into colder temps, our meals will heat commensurately. 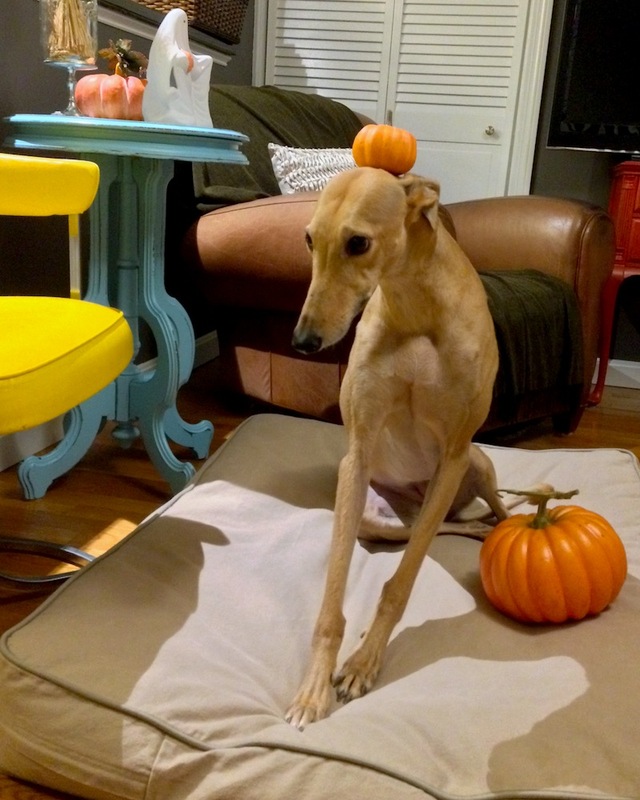 12) Frugal Hound’s Halloween costume. For me, fall delivers heavy, heady doses of nostalgia for my childhood. I remember each Halloween costume, each pumpkin patch trip, and each crackling fire in our fireplace. I did grow up in southern California, so admittedly my memories are a tad tinged with the idyllic autumns I read about in books. Now that we reside in Americana-laden New England, I can live out my fantasies of the quintessential, picturesque fall replete with apple picking, dazzling leaves, pumpkins ripening on the vine, early frosts, and ever-present turtlenecks and coats masking Halloween costumes. I can’t wait to introduce Babywoods to all these glories of the season. I’m thrilled her birthday will fall in the fall since it’s truly the time of year when I feel most invigorated. A wonderful thing about adhering to the innate offerings of each season is that, by and large, partaking of the richness is entirely free of charge. When we live in accordance with the seasons, and don’t try to fight back with our controlling human ways, we can enjoy the natural progression of life. Waking up to a chilly, unheated home enables us to truly savor our warm morning coffee and sweatshirts. Eating seasonally is less expensive and means we experience flavors once a year, which serve to enhance the pleasure we derive thanks to the uniqueness of it. Getting outside as much as possible before deepest winter sets in gives us a chance to appreciate how marvelous the waning sun feels. Finding opportunities to allow nature to unfold in our lives creates an existence where we’re in tune with the rhythms humans were intended to follow. It’s when we struggle against these traditional permutations that we’re forced to spend money. If we insist on wearing t-shirts year-round, we’ll have to pay handsomely for heating. If we insist upon eating the same foods every month, we’ll be charged for the privilege. And if we view every season and event as an excuse or requirement to spend money, then we’ll do just that. But it’s entirely possible to celebrate the seasons, Halloween, Thanksgiving, and all sundry holidays and festivals for very little money. After all, the greatest pleasures in this life are entirely free. What’s your favorite season? What savings do you realize by living in concert with the seasons? I am also very excited about being able to turn on the oven & cook inside more! Already made banana bread and crusty bread. Pumpkin is next! We harvested our apples yesterday which was such a fun Fall activity with the kids. Count me in as a fall-lover. Today might be the last day using AC = low utility bills for a month or two until winter begs the furnace to turn on. Weather is perfect. We’ve already been outside a lot more than we typically are during the hot muggy summers here in Raleigh. The leaves are just now getting a slight tinge of yellow in them, but the fall foliage should be spectacular this year. We have a great view along the length of our lake that really stands out during spring and fall. At least here, fall is much better than spring because there’s no thick clouds of pollen collecting on every surface everywhere. Living in a tourist destination, we refer to fall as native season. All the locals come out to play. And boy do we have a lot of fun! Fall is my favorite time. Great post, Mrs. Frugalwoods!! Fall is also my favorite season, and now that we live in Charlotte I actually get to enjoy it (as opposed to AZ!). My “splurge” is for sure fall-scented candles, but I’ve found Glade pumpkin & apple smell just as great as Bath & Body Works, but are about 1/7 of the cost! I have to admit, I am much looking forward to cooler temperatures so we can save on our utility bills! I also can’t wait to take our girls to the pumpkin patch, apple picking, and to all the festivals our city has to offer. You’re right – fall is just wonderful! Oh I’m sorry we didn’t get the chance to meet at FinCon! It was definitely a whirlwind–though so fun. Looking forward to next year already! I think Fall is my favourite season as well. I always see it as the start of the new year (throw back to years of schooling). There is something about the “death” and the promise of renewal that I find peaceful. Because we live in the country the wildlife this time of year is amazing (for the humans, exciting in a whole different way for the dogs). This morning on the walk we saw 6 deer (2 were right in our yard) and a group of wild turkeys. Happy almost Autumn! Oh wow–deer and turkeys! I’m jealous! All we get are squirrels here in the city 😉 (though Frugal Hound does get pretty excited about those). I love fall – back to school, leaves, apples, apple products, crock pots, cute decorations, bugs dying when the frost hits, sweaters…all my favourite things. 🙂 I have horses, so I seem to spend a bit more time outside, which I enjoy. The horses are starting to get the first hint of their fuzzy winter coats too. Although, I have a secret (well, not so secret anymore!! lol) that after 40 years in a cold, drastically-changing seasonal climate, I wouldn’t mind being somewhere a little less extreme in temperature variance! Fall is one of those things we don’t really get to enjoy here in Florida, as summer swiftly transitions to winter. It’s as if that part of the year didn’t really exist. So I guess I live the wonder of it vicariously through you! Pumpkins do make it down here however, and this year we’ll try to make pumpkin puree and stash it for the months ahead as well love making pumpkin soup and smoothies. Great article. Thanks! Just moved from MA to FL, and I have to admit that I never noticed the northeast/Midwest bias toward fall–the magazines, the TV shows, the pumpkin flavored everything. It’s hard to believe fall is this week, when it’s still 90F in Florida. But alas–we will have those lovely “fall” days and nights for six months, so I suppose I shouldn’t complain! ???? Exactly my point! Temperatures here are generally in the mid to upper 80s until around December, at which point, suddenly and unexpectedly, you wake up one day and it is a “frigid” 65 degrees; that generally means that grandpa winter has arrived. And you are correct, we only know winter is here because Starbuck begins to announce their diabetes inducing spiced pumpkin latte with 2 kilograms of sugar. Haha! It feels kind of sad to see the fall displays everywhere. Seems like the opposite of having your body and mind sync for the change in season. On the flip side, I am going to the beach tomorrow! Free and beautiful entertainment here on the Gulf coast! Fall is, without a doubt, my favorite season. I was up in Bar Harbor a couple of weeks ago and already spotted a few brightly covered leaves 🙂 Autumn in New England is like nowhere else on earth. It’s finally cooling off in Nashville, so I’m really stoked to start spending more time outdoors again. Plus, what could be more fun that DIY Halloween costumes? Thanks for another great post. 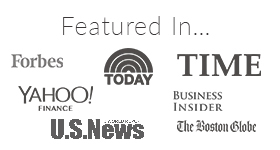 I am a recent subscriber to your blog and have really been enjoying your tips and writing style. I also absolutely love the photos of Frugalhound -what a sweet face! I like all the seasons! Well, here in Colorado I do. When we lived in PA, neither summer nor winter was tolerable. Bugs! Humidity! Nasty snow on the ground for two months straight! We lived at a boarding school and one the neighbor children broke her leg riding her bicycle in the gym during the worst of cabin fever. Much nicer here where the sun comes out and melts the snow and summer, though sometimes kind of attackingly sunny, is more restrained. Little Brother got into preschool off the waiting list, which means that five days a week (well, not today–teacher planning) I get to go out on my front porch with my new slippers and a cup of hot coffee with a drop of almond extract (yum!) to get some work done on my laptop. Then by afternoon, it is warm enough to enjoy a nice iced coffee in my finders-keepers stainless steel travel mug, at the playground. Can I just keep this season a little longer? Yum, I’m intrigued by the idea of almond extract in coffee… I love almond flavor. Will have to try this! For those of us who live in Arizona (or any other extremely hot climate), the fall for us is more than just a season change. It’s more than the start of football season (which is exciting enough!). It’s more than changing colors, earlier nights or the looming holiday season. For us it’s a reprieve, often just in the nick of time, from the sweltering heat that we’ve lived through during the summer. 100+ degree days finally become 90 degree days, and an occasional 80-degree day with rain brings a similar level of excitement that Seattle residents feel the first time that the sun emerges from the near-constant cloud deck in early spring. It was so lovely to hear your thoughts on autumn. Having lived all my life in the tropics in Australia, I’d never really had proper seasons until a couple of years ago when we moved to Europe. Seeing the changes of season thrills me! When we were living in Germany for 6 months, I delighted in the new autumn decorations in stores and in homes. These things I’d never really had. Sure, some dragged out some Halloween-y costumes and sweltered in them in the always hot temperatures (getting hotter as that was the slide into summer in the Southern Hemisphere)…but there never seemed to be that real distinct difference. I saw my first autumn window dressings today walking through our village in the English countryside and the first dropped conkers (horse chestnuts) on the ground. We’re moving from here to Wales in 2 weeks as well….so I feel that this autumn will be especially exciting for the changes will not only be all around us, but there will be big changes for us too! The 4th country in under 3 years ! As you say, one of the greatest parts of the changing seasons is the change in food. I love to eat seasonally and you’re right in that when you have to wait months until certain veg is in season again, it makes the experience so much better!! You’ve lived in so many interesting places–how fascinating to get to experience the seasons in all of them! Having been born in MN, my favorite season of all is winter. Of course it doesn’t fit very well with trying to be frugal when it comes to utility costs for most people. I no longer live in an area where there is much snow but I begin searching the sky for that first flake in November. For those interested in saving a great deal of money, especially if you live where it does snow, or the temperature dips below freezing – build a log house. Had I known what a money saver this was, I would have insisted on building one in my early married life. It is almost a miracle how the natural insulation of logs keeps the house warm in winter and cool in summer. While others bemoan the high cost of utilities, mine hardly ever changes. But, for me the magic of snow and the silvery beauty of the moon on trees sparkling with an icy shimmer are breath-taking. It is the season I am most creative. I can work on the art I sell for the next Christmas season during those luscious gray days. When I lived in CA, I hardly had any gray days. It never rains in Southern CA. So, my creating days were at a minimum and I had to focus on other areas of my life. But, winter is also the time of blazing fireplaces (only use fallen wood from the back 40), hot chocolate, skating on the lake, sometimes skiing, lots of different kinds of soups, and making snow angels. Happy autumn to you Frugals…I’m waiting for winter. This was such a lovely post! I also live in Colorado, which has the best seasons. Fall is fabulous — though I will admit, I love winter the best. What can I say — I love snow! But fall is such a great time to be outdoors. Here at our place we are busy cutting and stacking firewood, picking apples, making applesauce, turning tomatoes into sauce and soup and salsa, and harvesting carrots, onions, garlic and cabbages and transitioning the garden to fall/winter. So part of fall is working hard to get ready for winter, but much of the work is done outdoors, so we get to enjoy the beauty around us as we work. I LOVE Fall. I am going to try to take advantage of getting outside and enjoying the crisp weather and pretty foliage as much as possible this next month, because in Chicago we are typically fair game for snow come end of October hah. Not particularly looking forward to that, but it will force me to get creative with fun activities for Little Miss and I to do. I’d say Fall is my favorite season, followed by Summer. Oh, we are kindred spirits for sure (sans the candy corn)! There is nothing better than fall in New England, in my humble opinion. Only to be equaled by fall in a rural area (I’m partial to Vermont!! ), but all of New England and much of the northeast, to be fair, is spectacular. The barns, the festivals, the apples, pumpkins, squash, cooking, leaves, fog, mist, on and on. We’ve been having spectacular weather here, and we’ll take it, but it was 39 degrees this morning. We’ll be headed to southern Maine soon to enjoy the foliage and some lobster stew at Newicks! Happy girl here! I am, unabashadly obsessed with Fall! The comfortable temps! The pumpkins! The leaves! All pumpkin baking goods and cider! Not to mention homemade applesauce from pick your own orchards!! In fact, I excitedly contacted a friend who shares my Fall obsession. Fall Geeks through and through! We will let you join our inner sanctum! Candy corn also doesn’t look like corn. It is like the Grape Nuts of the candy world. Fall is definitely my favorite season. Perfect weather for snuggling under blankets (I loooooooooove blankets) and drinking hot tea while reading a book. Also, my kitties tend to get even more cuddlier this time of year. I know it’s for warmth, but it’s still nice. Fall is a great time of year — you forgot to mention football! We took a fall trip to New England a few years ago to see the changing of the leaves, it is a beautiful time of there for sure. Fall is my favourite season as well. I was born in fall, and my anniversary is in fall, plus I’m much more of a boots and sweatshirt girl than shorts and bathing suit girl. My most favourite frugal part of fall is how a single pumpkin can make two or three giant batches of pumpkin soup, two weeks worth of toasted pumpkin seeds (an excellent snack) and a great decoration. Frugal for the win! my pumpkins only have enough for one day of toasted pumpkin seed snacks. I’d need one of those gigantic pumpkins for the seeds to last two weeks. Seems like the temperatures finally dropped overnight this past weekend and I couldn’t be happier. We were still breaking 90 degrees last week! But this past weekend, Marge and I were camping in luxury tents at a farmhouse wedding in central NY, and I felt that cool breeze sweep in at night, and I knew fall had finally arrived! No more sweating! I was thinking recently how I’d be happy if it was autumn all year long, but then again, maybe it wouldn’t be so special then. I’d say Spring and Fall are jockeying for first place. Fall is great for all the reasons you mentioned and Spring is great due to everything turning green, cool temperatures, and finally coming out of cold, white, winter! Hooray for fall! I love staying in and baking when it’s crisp outside. Although in San Francisco where we live, the beginning of fall usually ushers in some of the warmest months of the year, which means lots of open windows (no one has AC here), hikes and picnics in the park. My favorite warm-weather fall treat is a cool pumpkin smoothie: I blend canned organic pumpkin puree with a frozen banana, unsweetened almond milk, a few ice cubes, cinnamon and nutmeg, and a little vanilla protein powder (I buy one without added sugar) for an extra boost. Tastes like pureed pumpkin pie and it’s so good for you! I don’t know that I have a favourite season, each one has its characteristics and properties that I like, however, I totally agree that fall does have a nostalgic feel to it. I also really do like the excuse to put on a big sweater and cozy up with a blanket on the couch. We’ve had such a warm fall (so far) that I really think we’ve got a good month until the heat goes on. I’m almost as excited for that as I am for the great excuse to drink tons of tea, chai, and cocoa. While I think every day outside is different, that’s dramatically more true in the fall. It makes me savor my time outside even more. But there were a brilliant three months of my life I lived in Salem MA, on a work assignment at the hospital in Newburyport, through the fall. Nostalgia isn’t what it used to be…. We’ve already had our first dusting of snow in Utah! It’s only sticking at high elevations and in the shade. Went backpacking for one night to a local high mountain lake this weekend and it was absolute fall perfection. The bluebird sky, the warm sun (but still can wear pants), the brown/orange/red/yellow colors, that cool crisp smell in the air, slightly tacky trail from just having rained a few days ago. It was a great trip with some girlfriends, not to mention we saved a lot of money by not driving far or paying for campgrounds or lodging (much more elaborate $$$ girls’ weekends were discussed, but we all were super happy with the local backpacking idea). Made up for it with great food! I too am absolutely head over heels in LOVE with autumn! Apple picking is in our near future, I keep looking for signs that the leaves have begun to change (no signs here yet) and yes, I’ve spotted candy corn in the stores. Yay! Autumn is here!!! It’s a small window here in Minnesota, but I love the time of year with no heat or AC! Ah yes! Turning the Ac off! Glorious times! Love the veggies and fruits in season! Our farmers’ market is great in Kansas City. I just picked up bell peppers of all colors, apples, zucchini, carrots, potatoes, and even grass fed beef for a steal (under $20!). Great for the budget, and I get to support local farms. I’m also going pumpkin picking Wednesday 😀 Can’t wait to make Shepherd’s pie, pumpkin muffins, and roasted veggies. Yum! Being a midwesterner living in Los Angeles, I get a little sad this time of year because there is no autumn in my life. Fall has always been my favorite season too, and I miss it so much. I’m totally with you on the candy corn thing. Hands down the best harvest of the season. Yes! Today, I put my gal in the stroller for a brief walk. An hour and a half later, and we finally trundled home for dinner. It was so wonderful to soak up the lovely weather. It’s still pretty nice here in Minnesota, and it was so good to enjoy that. It’s supposed to rain the next few days, and it’s only a matter of time before we are stuck inside most of the winter (tho we do snow shoe and cross country ski to help us get outside). But tonight was absolutely gorgeous and worth savoring. I keep singing the praises of north central Massachusetts for you to consider for your frugal Vermont homestead and so again in this most happy season, I suggest a Sunday drive – just about 1 hour 20 minutes from Cambridge. You might just love a visit to New Salem, Massachusetts, right next to Quabbin Reservoir, all decked out in fall beauty. In October, it’s the quintessential New England Village common with a 1794 meeting house, beautifully kept old houses with barns and amazingly brightly colored leaves lining the main road. Drive to the end of the South Main Street in New Salem center (nearly the end — to the end would put you in Quabbin Reservoir) and at the corner of S. Main Street and Lover’s Lane (yes) there’s an old new England house with beautiful old stone walls surrounding their orchard of hundred+ year old apple trees and pastures and a distant view of Quabbin Reservoir. To the side of the house, follow the driveway to the barn on any weekend in October, the old couple who live there sell their apples, warm apple cider (or cold), homemade apple cider vinegar in recycled bottles, apple butter, and warm donuts . You will not miss Vermont — and it’s much closer and very beautiful. Go Route 2 West, to 202 South (exit 16), follow the signs to New Salem historic district (less than 5 miles from the highway). 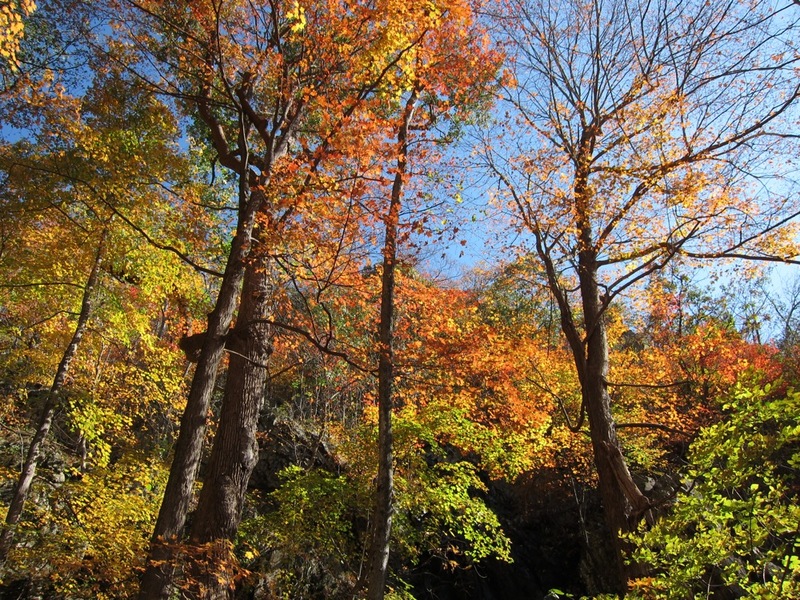 Bring your camera – you will want to capture the beauty of fall there. (Bonus, for a picnic spot with a view, drive behind the fire department building – or is it the town’s maintenance garage? –whatever it is, it’s on the right as you’re on your way out, drive down the driveway to the right of the building, keep going past the tennis courts, drive as far as you can, then park, and in a short 3 minute walk you will find a lovely spot with picnic tables and another gorgeous view of Quabbin.) For the expectant Mom, stop at the convenience store when you get off Route 2 at Exit 16 for conveniences, as there’s nothing else convenient in New Salem. Enjoy! Fall here in New England is the best! There are so many simple and frugal things to do. My favorite, kayak or walk/hike to see the changing colors, apple picking and all of the fun festivals and fairs! I also love having the ability to wear sweaters and boots again. Still rocking a pair of Target clearance boots from 2011 that people “swear” are a much more expensive brand. I proudly tell them they were a bargain! I think I may be the only person on the internet that doesn’t much care for autumn. Sure the trees are pretty, but we don’t have a lot of trees where I live. We just get less daylight and wildly varying temperatures here. At least it is a short season here since we usually get snow and winter temperatures by early November. I do agree with one thing on your list to love about autumn though, and that is candy corn. I know that it is entirely composed of things I would not normally eat, but dang is it addicting! That does it–I am making Pumpkin Bars this week! Candy Corn Rocks! I get the Indian corn ones. I live in LA so there are a few trees that turn but mostly the beaches are not as crowded. So this is the time of year I actually go to the beach. It is cheap and cheerful. No climate control is the best! I love having the windows open!!! My absolute favorite season also! Last night I baked pumpkin chocolate chip muffins to take to work in celebration of the first day of Autumn. I’m going apple picking soon and hope to preserve lots of applesauce! Im a fall aficionado also. One thing I do in fall, when pumpkins get really cheap, is bake them, mash them and feed it to our dogs as part of their natural but frugal diet. 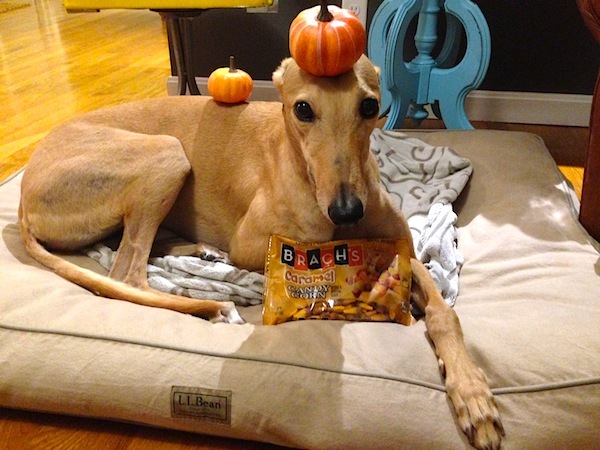 Dogs LOVE pumpkin and it’s great for them. I freeze extra and use some for us. Occasionally, my husband gets a pie. Fall is my favorite time of year, too! As a fall baby, my birthday was September 17, I have grown up enjoying the sweet crispy smells and bright hues of autumn. The dampened grass of a football field, the quiet fog that rolls in, the garden bounty from family it brings us all together and gets me excited for the upcoming holidays. I put up my fall garland that I have had since my ‘working at Michael’s’ days’ and it brought a smile to the whole family. Yesterday, while the baby napped and the kids played I sat outside and watched the clouds roll by and fell asleep in the afternoon sunshine. Priceless! 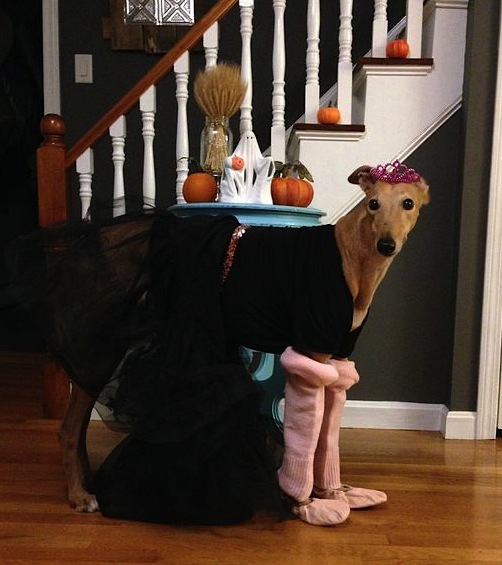 Love Frugalhounds ballet costume. Very elaborate! 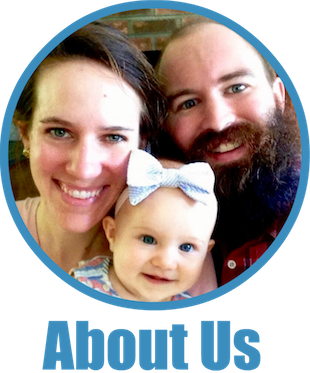 Thanks so much for this blog — loved it! You inspired me to put out my autumn décor, even though Ontario Canada is still experiencing very summer-like weather! My feeling of summer is hot (good), but autumn is warm/cool and cozy (wonderful).